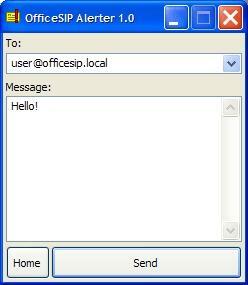 OfficeSIP Alerter is a simple easy-to-use and free sip messenger. It was not designed for prolonged chat it is handy when you need to send or receive single message. It is good replacement for old-fashioned Alerter Service. OfficeSIP Alerter has simple interface but it is based on Session Initiation Protocol so you can exchange messages with users of Windows Messenger or other sip messenger.